My ultimate favorite cuisine that I will always and forever consider my go-to when it comes to starting a healthy diet is Mediterranean. It consists of simple and fresh ingredients / recipes, everything can easily be modified to be plant-based focused, and the flavors are light but bold in the slew of recipes that this type of cuisine offers. So today’s recipe is a nourishing Mediterranean bowl that combines some of my favorite flavors from my travels to this part of the world. 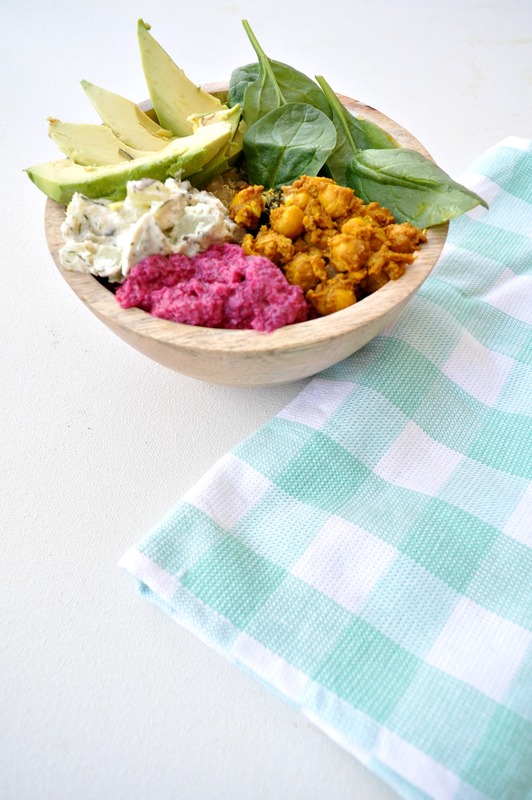 It’s a simple combination of quinoa, curried chickpeas, beet dip, dairy free tzatziki and more. This is a complete vegan recipe. I used a lot of the ingredients that I received from Pangea Nutrition, which is a Mediterranean meal delivery service that I recently had the opportunity to test out. They deliver groceries directly to your door with recipes to create extremely easy Mediterranean meals – so the hassle of trying to figure out what to cook throughout the week (cause we know you’re already busy), is solved! So in this one article you’re getting 3 recipes that are then going into one big bowl, hooray! Cook desired amount of quinoa according to package instructions and set it aside. 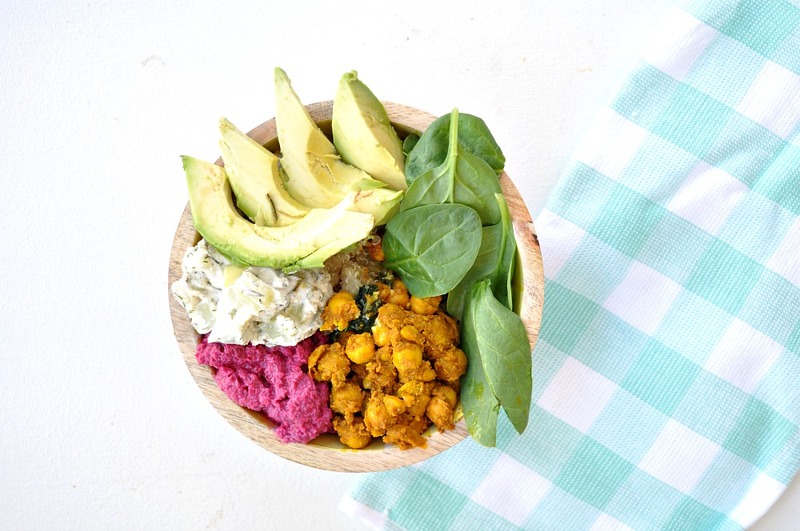 Prepare the remaining toppings via the directions below (beet dip, curried chickpeas, and dairy-free Tzatziki). Place the quinoa in a bowl, then top with a scoop of the Tzatziki, chickpeas and beet dip, sliced avocado, and a handful of spinach. Drizzle with olive oil and enjoy! In a food processor or blender place the soaked cashews, tahini, lemon juice, salt and pepper, and garlic cloves, and blend until creamy, scrapping down the sides as necessary. Then, transfer the mixture in a large mixing bowl. Add and stir/blend in all remaining ingredients, adjusting the amount of each as necessary (depending on how strong of a particular seasoning you want to taste). They are also offering 50% off for first time users for the first week of groceries, you can learn about that cool deal here! Disclaimer: Ingredients are courtesy of Pangea Nutrition, all wording and creative direction is our own.